Paul again visited the place of worship by the riverside. This time he saw a slave girl whose body had been taken over by a demon, an evil spirit. She was able to tell people what was going to happen in the future. Her owners saw they could make some money by having her tell people what was going to happen to them. They were glad the poor girl was possessed by a demon. As she followed Paul and the others around, the demon in her recognized who they were and shouted, "These men are servants of the Most High God who are telling you the way to be saved." Immediately the evil spirit left her, and she was in her right mind, but she could no longer foretell the future. Her masters could not use her anymore to gain money for them. You can imagine their anger at Paul, who had ruined their fortune telling business. They grabbed Paul and Silas and dragged them before the authorities, accusing them of causing an uproar and teaching against their way of life. Then the crowd was stirred up and became angry, and the magistrates (MAJ ih strates), or judges ordered them to be stripped of their clothing and beaten. They were unmercifully flogged and then, weak and bleeding, they were thrown into an inner cell of the prison and their feet were put in stocks. Their legs were spread wide apart and their feet put through holes in the wooden device which was used for torture as well as for securing the prisoners. Then a jailer was commanded to guard them. If he failed to keep them in the prison, he would be killed. He had a great responsibility. 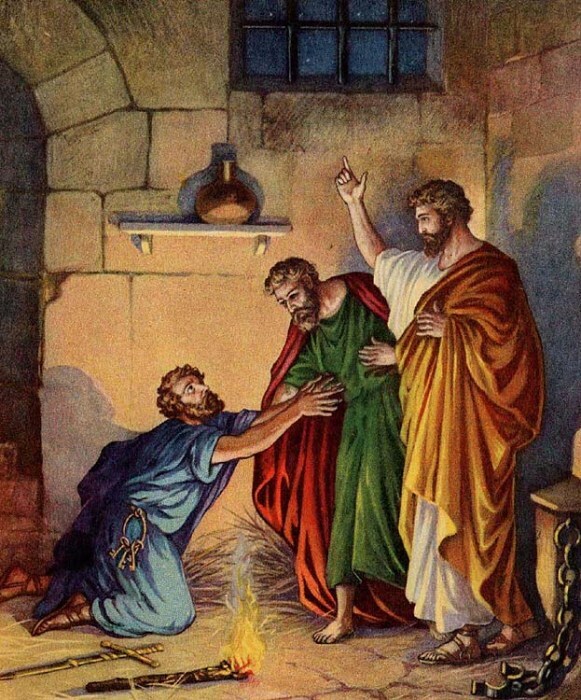 Did Paul and Silas moan and complain about being beaten and put in prison? No, the Bible says that about midnight they were praying and singing hymns to God. There were other prisoners in the cell listening to them. Suddenly there was a great earthquake, and the prison shook. The doors opened and the chains came off all the prisoners, but nobody tried to escape. However, when the jailer woke up and saw the doors opened, he started to take his own life because he knew he would be killed if his prisoners had escaped. Paul shouted, "Don't harm yourself! We are all here!" The jailer was so frightened he was trembling. He called for some lights so he could look inside the cell. He fell down at the feet of Paul and Silas. He said, "Sirs, what must I do to be saved?" They told him to believe in Jesus, and they preached about the Lord to the jailer and the people of his household. That same hour he took the two men and washed the wounds they had received in the beatings. He knew he had been wrong, and he wanted to do right. Immediately the jailer and his family were baptized. 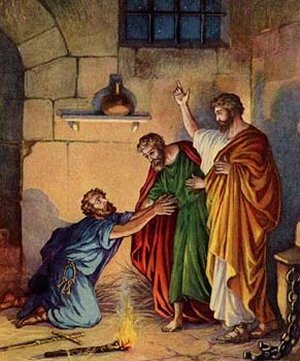 He brought Paul and Silas to his house and fed them. The whole family was so happy! They were now believers in God. The next day officers were sent to the jail to tell them to release Paul and Silas. When the judges learned that Paul and Silas were Roman citizens, they were alarmed. It had been against the law for them to beat and imprison the men. They thought they could just quietly take care of it. But Paul thought differently. "No!" he said, "Let them come themselves and lead us from the prison." The judges went to the prison and apologized. They led the men out and begged them to leave the city. Paul and Silas went back to Lydia's house and met with the believers there. Then they left to go preach elsewhere. God will always take care of us and even when seemingly bad things happen to us, great good can come from it. If Paul and Silas had not been in prison, the jailer would not have had the opportunity to hear about Jesus. English Bible Activities Select story #262 in the list for activities to accompany this Bible story. Spanish Bible Activities Select story #262 in the list for activities to accompany this Bible story. This page displayed 112,945 times.